This month we’re meeting at the Wine Rack in Lower Parel. Every month on the first Wednesday ANZBAI members and their friends get together socially at a new venue in different parts of the city. This month due to new year disruption we’ll be meeting later in January on 16th instead. Non-members are also invited although members receive their first drink free. The British Business Group (Mumbai) is organizing its annual charity ball : 'The Great British Ball 2018' on Saturday the 8th of December 2018 in The Regal Room, Trident Nariman Point. They have extended an invitation to ANZBAI members to attend the ball which is their initiative to raise money for charity. Last year they managed to raise 14 lakhs which was divided between two charities: Muktangan & Fight Hunger Foundation. A table of 10: Rs. 65,000 inclusive of taxes. Tickets are selling out fast so block your place today. All Things Nice invites ANZBAI Members to join them for an extravagant four course wine dinner paired with a selection of wines and cognac at the uber exclusive Chambers - Taj Lands End. MENTION ANZBAI WHEN BOOKING FOR A 10% DISCOUNT! for wines, luxury spirits and gourmet food aficionados. Perhaps you missed the Bollywood Nights party? Perhaps you just missed your mates? 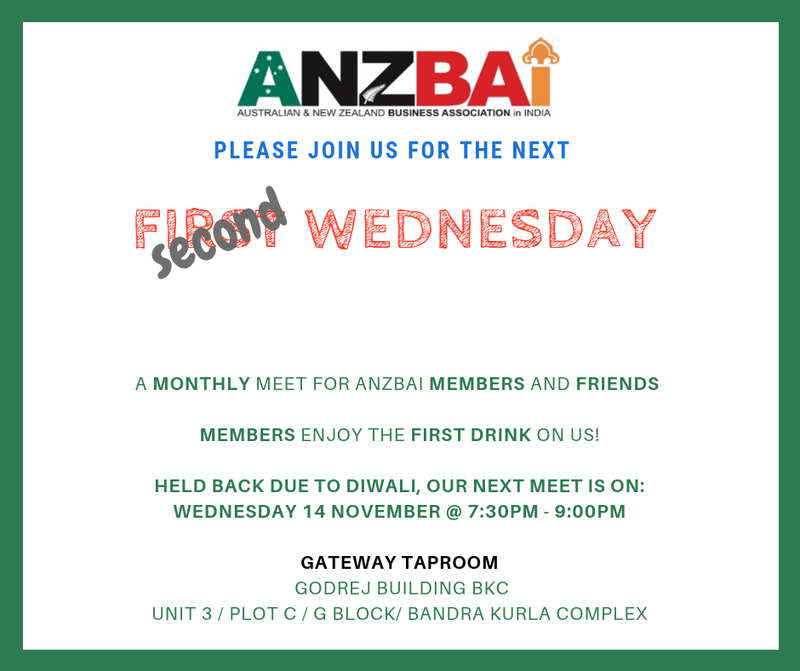 Well don’t miss the next gathering of ANZBAI’s First Wednesday, happening on (the second) Wednesday, November 14th at Gateway Taproom in BKC. Members enjoy the first drink on us, but feel free to bring a friend along if you like (as long as they bring their wallets). The theme evolved from the Lene’s exploration of grids and patterns as representations of social construct and identity, and the diptychs address the falling "in between" in various cultures. A mixed-media artist, Lene primarily combines digital and traditional tools and mediums like paper and digital collages, watercolours, acrylics and graphite. Lene presents her work on Tuesday, 13 November at Mumbai’s Jehangir Art Gallery. Visit the Australia Fest website here. Internationally acclaimed Australian performing arts company, Bangarra Dance Theatre will be performing Spirit 2018 on Thursday, 1 November 2018 at the Jamshed Bhabha Theatre, NCPA at 7:30pm. Led by Artistic Director Stephen Page, Bangarra Dance Theatre are in their 29th year, but their dance technique is forged from more than 65,000 years of culture, embodied with contemporary movement. The company’s dancers are dynamic artists who represent the pinnacle of Australian dance. Each has a proud Aboriginal and/or Torres Strait Islander background, from various locations across the country. Their relationships with Aboriginal and Torres Strait Islander communities are the heart of Bangarra, with their repertoire drawn from stories gathered from respected community Elders. Authentic storytelling, outstanding technique, and deeply moving performances are Bangarra’s unique signature. This is the centrepiece event of Australia Fest, a six-month long festival of Australian culture, creativity and innovation in India. Drinks, dinner, and dancing are all included so make sure you secure your place by registering today. Preparations are already well underway, interest is running high, and this looks to be a sell-out event. Entry is open to ANZBAI members and their friends – some people have already made group enquiries so get your (jewel encrusted) skates on! There will be prizes for the best dressed and best dance moves among other things. We will be giving away a couple of cricket bats signed by the New Zealand captain and several bottles of wine from our friends at Good Drop Wine Cellars. Our sister organisation the Australia New Zealand & India Business Association (ANZIBA), based in Delhi, has extended an invitation our members to attend their session on Australia’s India Economic Strategy should they be in Delhi on the 11th of October. Usually starts at 7:30PM but the location and venue details of this particular event are pending, but save the date and check back soon for more information. Otherwise subscribe to the Bush Telegraph to receive the event details straight to your inbox. Unfortunately this year we have had to cancel our AFL Grand Final screening event. The Australian World Orchestra reunites for its second tour to India in September 2018 as a highlight of ‘Australia Fest’, a festival of Australian culture and creativity taking place across the country. Led by Artistic Director and Chief Conductor Alexander Briger AO, the tour sees the Australian World Orchestra return to Chennai and Mumbai, and the first performance in Kerala of a western symphony orchestra, taking place in an unusual concert venue within the sumptuous surrounds of the newly opened Grand Hyatt Kochi Bolgatty. 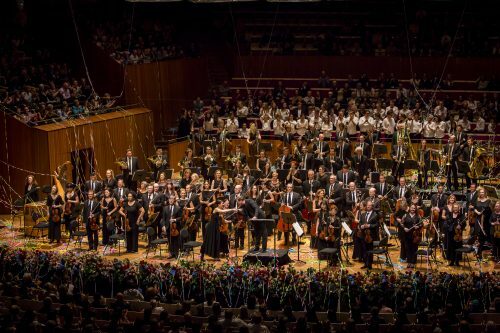 The programme, including operatic and symphonic works by Mozart, Bizet and Beethoven, will be performed by 52 of Australia’s finest musicians from the world’s leading orchestras including the Vienna and Hong Kong Philharmonic Orchestras, the Antwerp and London Symphony Orchestras, and musicians from the Australian state orchestras. A special highlight of the concerts will be a solo performance from the outstanding violinist Daniel Dodds (Artistic Director of Festival Strings Lucerne) of the virtuosic Rondo Capriccioso by Saint-Saens performed on his 1717 Stradivarius violin. The Australian World Orchestra is also delighted to announce mezzo-soprano Caroline Meng as guest soloist in Cochin and Mumbai where she will perform 3 famous arias from Bizet’s opera, Carmen. The Paris based Meng is acclaimed for her versatility across a variety of musical styles ranging from opera to recital and sacred concerts. Limited seats available block your tickets now and experience the unparalleled classical music. Click here to book your tickets. Visit to the tour website. This performance is a part of Australia Fest , a six-month long festival till March 2019 which celebrates Australian culture, creativity and innovation in India. The festival will include 75 events across 20 cities and will cover performing arts, visual arts, literature, virtual reality, film, food, sports, children’s content and more. 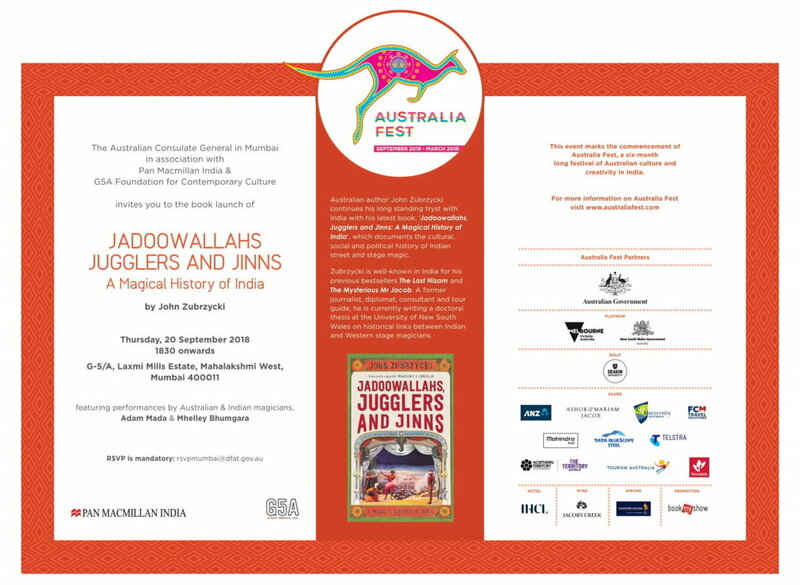 The Australian Consulate General in Mumbai in collaboration with Pan Macmillan India and G5A Foundation for Contemporary Culture are delighted to invite you for the book launch of JADOOWALLAHS, JUGGLERS AND JINNS: The Magical History of India by John Zubrzycki on Thursday, 20 September 2018 from 1830 onwards at G-5/A, Laxmi Mills Estate, Shakti Mills Lane, Mahalaxmi West , Mumbai. The launch will feature performances by Australian and Indian magicians, Adam Mada and Mhelley Bhumgara. This event marks the commencement of Australia Fest, a six-month long festival of Australian culture and creativity in India. 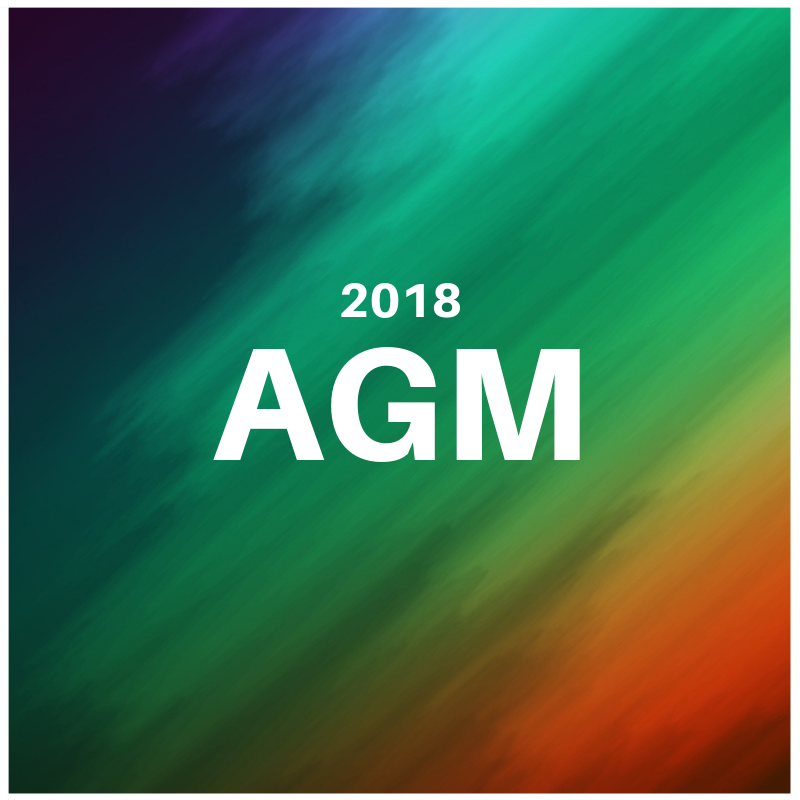 Members are invited to attend the 8th Annual General Meeting which is currently scheduled for 5:30pm on Wednesday, 19th September 2018. The Board Room, Maharashtra Cricket Association (MCA), G- Block, BKC Bandra Kurla Complex, Bandra East, Mumbai- 400051. Every month on the first Wednesday of the month ANZBAI members and their friends get together socially at a new venue in different parts of the city. ANZBAI members receive their first drink free and 10% of all subsequent drinks. Non-members and friends of ANZBAI are also invited. 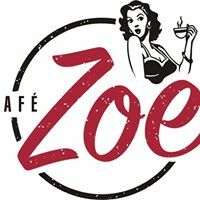 This month we're meeting at Cafe Zoe in Lower Parel at 7:30pm, on Wednesday the 5th September. Join Sommelier Nikhil Agarwal for a blind wine tasting of Indian and International wines at The Wine Rack on 23rd August 2018 at 8pm. All Things Nice are happy to offer a 10% discount to ANZBAI Members who wish to join them. The Asia Society, India, in partnership with the Australian Consulate General - Mumbai, host a discussion with Her Excellency Harinder Sidhu (High Commissioner of Australia to India) and Dhruva Jaishankar on the new era of the India-Australia relationship. Australia should make an ambitious commitment to partner more with India says the recent economic strategy report by Peter Varghese, former Foreign Secretary and Envoy to India. The strategy aims to strengthen economic and trade ties and consolidate strategic relationships between the two countries. It prioritises ten sectors and ten states that will be avenues for collaboration; education being Australia’s ‘flagship’ sector with resources, agribusiness and tourism identified as important ‘lead’ sectors. It also aims at creating opportunities, promoting economic growth and sustained economic relations between both countries. From securing channels for trade and transport to strategic partnerships in the Indo-Pacific, India and Australia are aligned towards a safer, prosperous and more stable Indo-Pacific. Join us for a conversation with H.E Harinder Sidhu, the Australian High Commissioner, and Mr Dhruva Jaishankar, Fellow of Foreign Policy Studies, Brookings, on the strengthening India-Australia relationship and Australia’s plans in the Indo-Pacific. Harinder Sidhu is a senior career officer with the Department of Foreign Affairs and Trade, most recently serving as First Assistant Secretary of the Multilateral Policy Division. She has previously served overseas in Moscow and Damascus. Ms Sidhu’s previous roles included First Assistant Secretary in the Department of Climate Change, Assistant Director-General in the Office of National Assessments and Senior Adviser in the Department of the Prime Minister and Cabinet. She holds a Bachelor of Laws and a Bachelor of Economics degree from the University of Sydney. Dhruva Jaishankar is a Fellow in Foreign Policy Studies with Brookings India in New Delhi and the Brookings Institution in Washington DC. He is also a non-resident fellow with the Lowy Institute in Australia. His work focuses on India's foreign and security policy, with particular attention to relations with the United States, Asia and the Indo-Pacific, and Europe. Mr. Jaishankar is a regular contributor to the Indian and international media. 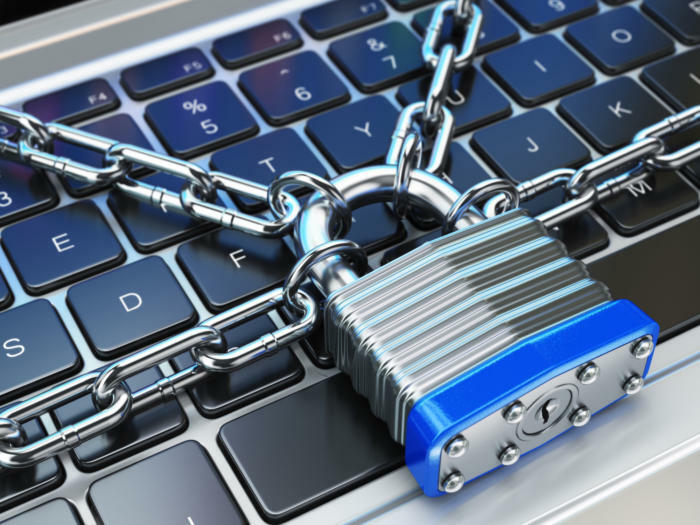 He holds a Master's degree in Security Studies from Georgetown University and a Bachelor's degree in Classics and History from Macalester College. ANZBAI Invites you to come and enjoy a lazy, relaxing afternoon munching and branching in the rain with family and friends. International wines, beers, mocktails, fruit and salad bar. A huge range of international and Indian foods with live stations. Deserts include ice creams and various sweet treats. Dedicated and manned kids area with loads of fun activities. 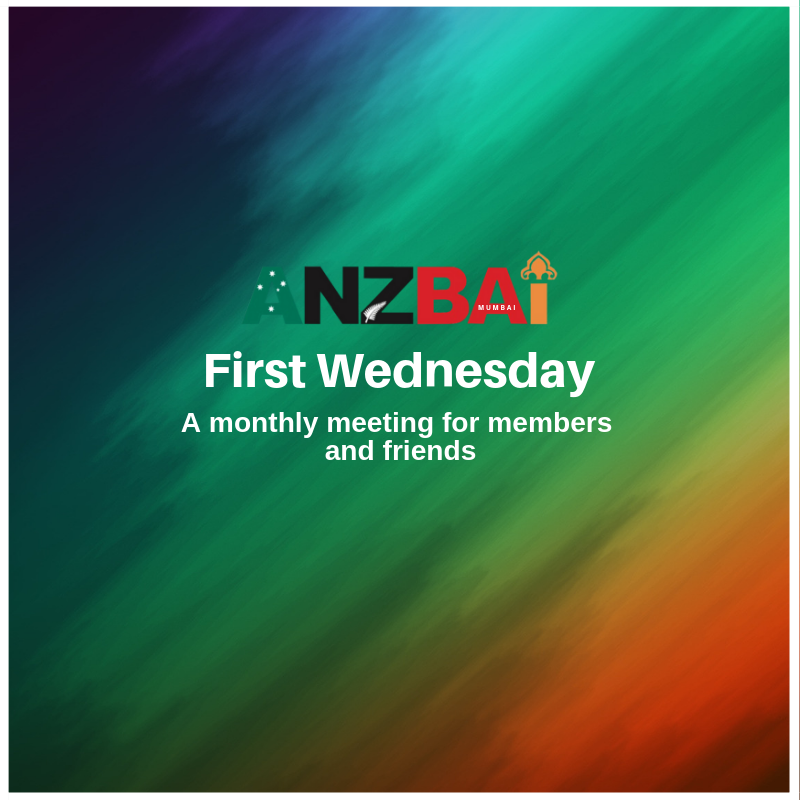 Every month on the first Wednesday ANZBAI members and their friends get together socially, each time at a new venue in a different part of the city. Non-members are also invited although only members receive their first drink free. This month we're meeting on the top floor at the House of Tipsy in Bandra at 7:30pm, Wednesday 1st August 2018. 3/4, Dheeraj, Pali Arcade, Dr. Ambedkar Road, Pali Naka, Pali Hill, Bandra West. Check back here for details as this event comes together.